The software giant's second-quarter report showed accelerating sales growth and pointed to more gains ahead. 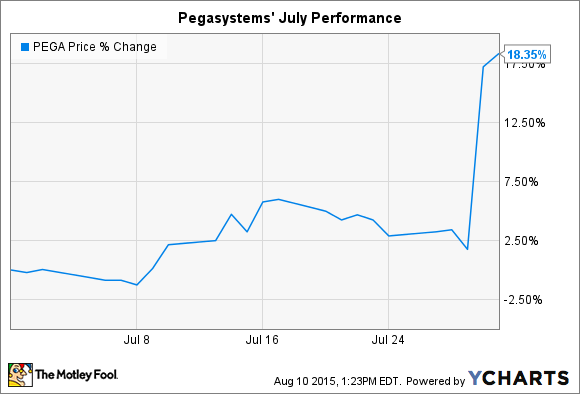 What: Business management software company Pegasystems' (NASDAQ:PEGA) stock rose by 18% during the month of July, according to S&P Capital IQ data. That surge pushed shares to a new all-time high -- up 30% so far in 2015. So what: Pega's second-quarter earnings report, posted on June 29, was responsible for most of the July stock bounce. In that announcement, it reported sales growth that accelerated from the first quarter's 8% gain to reach 13%. Revenue growth benefited from Pega's signing of several major new clients including a large U.K.-based telecom company and one of the biggest banks in France. Profits also came in higher than expected despite ramped-up business investments. Net income improved to $11 million compared to $8 million in the prior-year period. But the good news stretched beyond just those headline results. Pega's lucrative cloud and licensing services revenue, for example, rose at a faster pace than its professional services sales, helping push overall profitability higher. Shareholders can expect that happy trend to continue over the next few quarters since management has made it a priority to focus its marketing and sales efforts on the high-margin businesses. Meanwhile, order backlog, which is contracted but not yet billed sales, gained 11% last quarter. That tells us the recent sales bounce wasn't due to the timing of a handful of large deals, but instead indicates a broader pickup in demand for Pega's business management software products. Now what: In fact, the improving business picture gave management enough confidence to raise their 2015 sales guidance. The first two quarters of the year went better than originally planned, and CEO Alan Trefler and his team see an even stronger second half in store. "We now believe we'll modestly exceed our previously issued revenue guidance," Chief Financial Officer Rafe Brown told investors in a conference call. Shareholders can look for Pega to book 14% higher sales in 2015 as management works to sign new clients while using existing business relationships to deploy its growing pipeline of new products to the customer base. And as long as it keeps up that above-market growth rate, the stock should hold on to its premium valuation that's now climbed to 70 times trailing earnings.